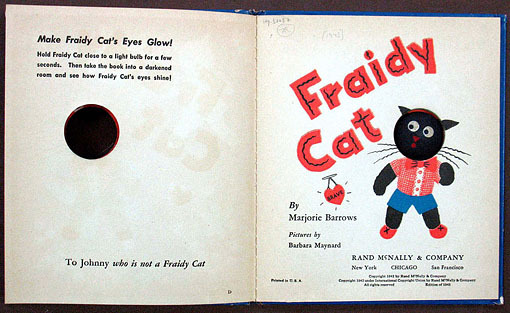 Fraidy Cat. New York, Chicago, San Francisco: Rand McNally & Company, 1943. - SOLD - 19.4 x 16.8 cm. 25pp., with cat's head (made of cloth) using fourteen different poses. Original pictorial boards, spine and corners slightly rubbed, pictorial endpapers.